INDUSTRY.co.id - Jakarta - The Media Workers Forum asked the government to investigate the attack on the print media office of Radar Bogor by a person from the Indonesian Democratic Party of Struggle (PDIP). The Media Workers Forum comprises the Jakarta Media Workers Union, the Independent Journalist Alliance (AJI), the LBH Press and the Independent Media Workers' Forum (FSPM). They speech at Bundaran Hotel Indonesia (HI), then walk towards Jalan Thamrin, Central Jakarta. During a rally, Coordinator of Action, Chiko was arrested to stop doing the action by police officers. But they finally stepped aside and continued the action by walking towards Jalan Thamrin. The raiding of the Bogor Radar Office which was carried out by sympathizers of the Bogor PDIP again occurred on Friday, June 1, 2018. Even the actions performed coincide with the birthday of Pancasila. Previous PDI-P sympathizers also took the same action on Wednesday, May 31, 2018. The first action was accompanied by beatings and destruction of office properties. The Media Workers' Forum regrets that the police have not yet thoroughly investigated the first post on Wednesday, so that similar action is repeated, "said Independent FSPM Chairman Sasmito. Though these activities have violated the law and threaten the freedom of the press, he said. 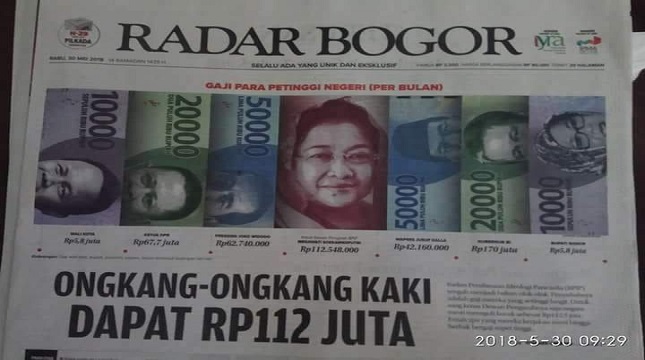 The violence carried out by this PDIP cadre originated from Radar Bogor's "headline" objection entitled "Ongkang-ongkang kaki (Rp112 million)".